I wasn’t that excited to go to Munich. I had heard mixed reviews from friends who had visited, I thought it would be a tad boring to not be there during Oktoberfest, and yes, ok, I was a little biased by the 1972 Olympics. Who can blame me?? Luckily for me and my stubborn self, Tyler was the most excited about Munich out of all of the cities on our itinerary. He took the reins and planned the two days we had there. **Spoiler alert** I ended up LOVING it. We had so much fun here and were reluctant to pack up after a couple of days. As I’m sure you’ve gathered, our little blog isn’t nearly far along enough to warrant a sponsorship from a hotel. Hotel Blauer Bock, however, deserves a bullet on this list just because it is awesome. This clean, modern, and tastefully decorated hotel is just steps away from everywhere you want to be while visiting Munich. It sits right around the corner from the Marienplatz (main square), just down the road from the Viktualienmarkt (see #2), and directly across the street from Eataly Munich (yes, we know that it isn’t German, but come on). The staff at Blauer Bock was helpful and friendly, and the breakfast was amazing. This is our #1 hotel recommendation from this trip. Nestled right in the city center, the Viktualienmarkt is an open air market where vendors sell produce and food. Close your eyes and imagine a farmer’s market in heaven, and that’s exactly what this place is. We loved walking around this quaint, bustling market and ate here for nearly every meal. Potato Soup, Quiche Lorraine, and fresh fruit–what more could you want out of life?? Also, PLEASE go across the street to Cafe Frischhut and grab a Smchalznudel, a traditional soft pastry sprinkled with sugar (yes, like a doughnut but 100x better). In an effort to work off the aforementioned market purchases, we rented bikes from Leroy’s Bikes. There are a few companies right next to the Viktualienmarkt, and we paid 10 euro each to rent bikes for four hours. The guy who loaned us the bikes, who I like to think was Leroy himself but I’m sure wasn’t, pointed us towards the path that runs along the river. We road next to the river, through the city, and over to the English Garden (see #4). 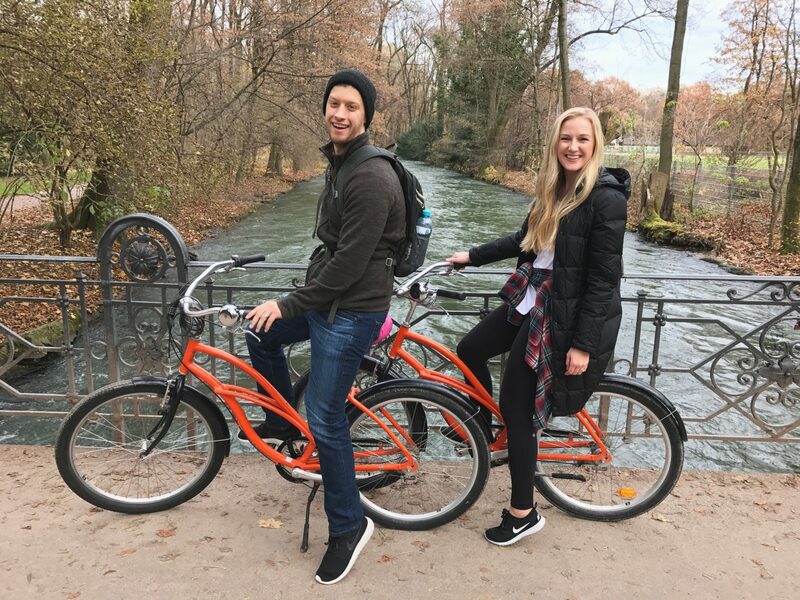 Munich is very bike-friendly, and this was such a fun way to experience the city. Right on trend with my indifference toward our plans for Munich, I had pictured the English Garden as a patch of green taking up a block or two- maybe a few rose bushes and a fountain, if we were lucky. (I’m a brat, I know). As it turns out, the English “Garden” is a sprawling park covering almost 1.5 square miles. It’s the biggest city park in Europe, actually. And it’s stunning. We rode our bikes through the pathways for hours, stopping to watch surfers in the river (I know, right?) and at the Biergarten for a quick stein and a “currywurst” (brat served with ketchup mixed with curry powder, don’t knock it ’til you try it. And maybe don’t try it ’til you’re a beer or two in). A somber but extremely important bullet on this list is our visit to the concentration camp at Dachau, just outside of Munich. We used our car to get there, but it’s also just a quick 20-minute train ride from the city center. We listened to the audio guide provided at the visitor center to tour the museum and grounds. The first concentration camp established during the Holocaust, Dachau was used as a model for the rest of the camps built by the Nazis. I’ll never forget this experience. I’ll never forget feeling the weight of the atrocities and darkness that happened at this place. We think it’s important, if given the opportunity, to see and seek to understand the horrific reality that the victims of the Holocaust faced. We missed Oktoberfest earlier in the fall, but we did our due diligence to make sure to experience the beer hall culture in Munich. It was a little touristy, but we did stop in for a beer at the famous Hofbräuhaus. We think it’s worth checking out. On our second night, we went to three breweries with the Size Matters Beer Tour (lol), and it was a BLAST. Our guide shared a ton of history about the breweries and the city of Munich as we walked between halls. Also, another perk of the offseason: there were only six people in our group which made it so much more fun and, dare I say, intimate. We loved seeing the Löwenbräu, but our favorite was the unique underground cellar at Augustiner-Keller (and not just because the waiter gave me a rose). A few things that we missed that would have made us more sophisticated: The Residenz, the Deutsches Museum, Munich City Museum, and the Nazi Documentation Center. We’d also love to see FC Bayern Munich play at Allianz Arena. We can’t wait to go back. In the meantime, we’ll savor the memories of brews and brats.